One of the hardest things about reporting on President Trump is his tendency to propose wild ideas out loud and then repeat them before coming to his senses or getting talked off the ledge, Axios' Jonathan Swan and Jim VandeHei point out. So the media, us very much included, break news on controversial ideas that never happen, leaving all of us to wonder: Was this a real idea killed by exposing it, or a POTUS brain blip? 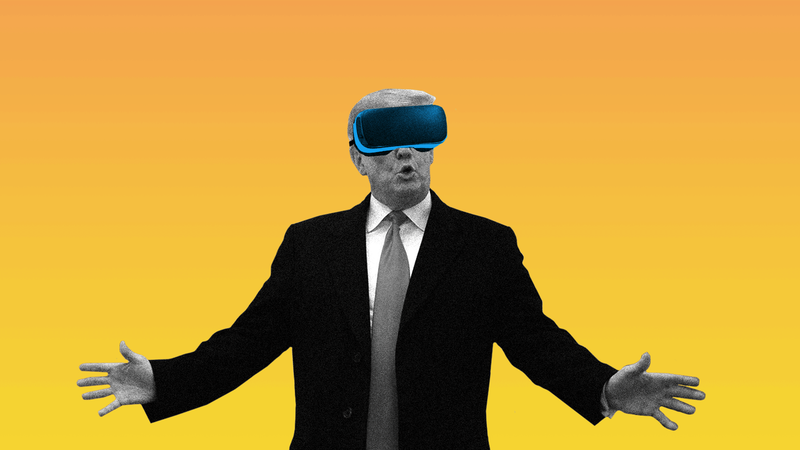 It’s the virtual reality dimension of this presidency. Rudy Giuliani, the president's personal lawyer, wants you to know: "I never said there was no collusion between the campaign, or between people in the campaign. 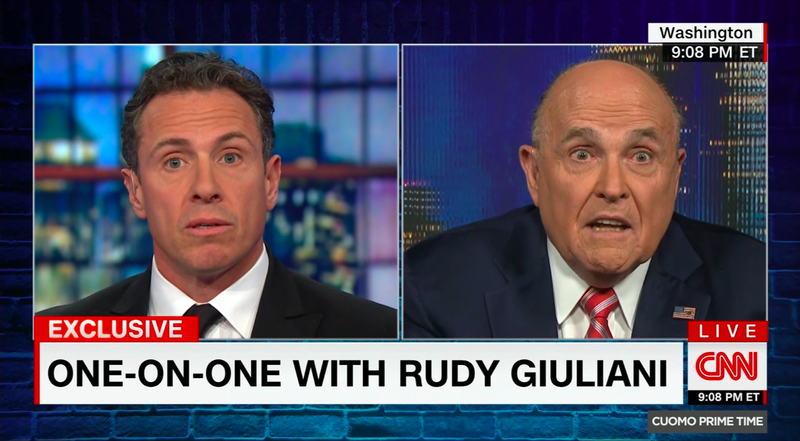 I have no idea if — "
When CNN's Chris Cuomo interrupted to point out that Giuliani had said that, Rudy interjected: "I have not! I said the president of the United States. There is not a single bit of evidence the president of the United States committed the only crime you could commit here — conspired with the Russians to hack the DNC." Brian Williams said on his MSNBC show, "The 11th Hour": "That was the sound of goal posts being moved." Flashback ... Giuliani to Swan in November: "I don't think they have any evidence of collusion of any kind." And some earlier goal-post moving by Rudy, from "Fox & Friends" in July: "Collusion is not a crime." Driving the conversation ... Garrett M. Graff in WIRED: "Either the president is compromised by the Russian government ... or Trump will go down in history as the world’s most famous 'useful idiot,' as communists used to call those who could be co-opted to the cause without realizing it." Sen. Rand Paul (R-Ky.) said after leaving a White House meeting yesterday that not only is President Trump "following through with his Syria policy, I really think there will be changes in Afghanistan, as well," Axios' Jonathan Swan reports. Paul, who wants America to withdraw quickly from foreign wars, told reporters on an evening call that he was "really proud of the president" for arguments he made in the meeting with a small group of senators. Paul said Trump mentioned in the meeting how much money the U.S. had been wasting in these foreign wars, especially in Afghanistan. He said Trump mentioned "luxury hotels" there — possibly a reference to plans for a swanky hotel reported by NPR in 2016. Between the lines: Trump at times has vented frustration and regret that he allowed his national security team to talk him into a plan — which ran against his own instincts — to keep, and even boost, American forces in Afghanistan. A senior administration official told Swan that when bad news broke about Afghanistan in the wake of that decision, Trump would vent to his generals that it was "your" plan. What's next? Paul said he didn't want to talk about timelines for withdrawal from Syria and Afghanistan — he would leave that to the president. But he conceded that it sounded like Trump "probably will still be there [Afghanistan] longer than I would like to." Paul was encouraged that Trump seemed to be preparing "to acknowledge success and victory," and not stick to an open-ended commitment. Paul said the deaths of service members affect Trump: "He's not willing to endlessly go on and on and on ... He wants a different future for our country." According to a source familiar with the meeting, Sen. Marco Rubio (R-Fla.) argued against Paul’s position and told Trump that "the U.S. made big progress, but pulling out too soon" from Syria "will undermine that progress." Rubio has been making the argument that ISIS "is morphing because of U.S. action from a caliphate to an insurgency," the source added. 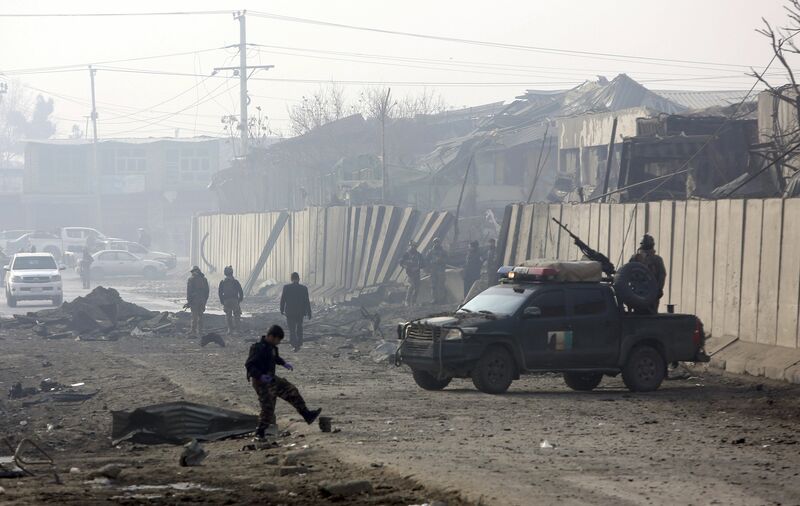 "Insurgencies are blending into populations. They are tough to beat, especially by air power alone." Apple CEO Tim Cook writes for TIME: "In 2019, it’s time to stand up for the right to privacy—yours, mine, all of ours." "This problem is solvable — it isn’t too big, too challenging or too late. Innovation, breakthrough ideas and great features can go hand in hand with user privacy — and they must. Realizing technology’s potential depends on it." "That’s why I and others are calling on the U.S. Congress to pass comprehensive federal privacy legislation — a landmark package of reforms that protect and empower the consumer." "[W]e believe the Federal Trade Commission should establish a data-broker clearinghouse, requiring all data brokers to register, enabling consumers to track the transactions that have bundled and sold their data from place to place, and giving users the power to delete their data on demand, freely, easily and online, once and for all." Why it matters, from NBC's Dylan Byers: "This is Cook's most aggressive call for federal action on data privacy to date. It is also another shot at rivals like Facebook and Google that have left user data vulnerable to third parties." Fences already cover as much as 690 miles of the border between the U.S. and Mexico, and the number of border agents has almost tripled in the past two decades, Axios' Stef Kight writes. That still leaves more than half of the almost 2,000-mile border uncovered. Plus there are gaps and dilapidated fencing in the current barriers. There are lots of natural barriers — deserts, mountains, rivers. But many of the existing barriers deter only vehicles, not pedestrians. Farmland is on both sides of much of the empty swath along the Texas border in the map above. So a wall would require massive disruption and acquisition of private property, probably through use of eminent domain. The border runs through the rugged, mountainous terrain of Big Bend National Park for 118 miles. Local government officials fear that a wall would negatively hurt wildlife and look bad in the park, per NPR. 62 miles of the border are part of the Tohono O'odham Nation Reservation in Arizona. The nation has historic ties to Mexico and tribe members there who would be cut off from each other by a wall, according to USA Today. 6. 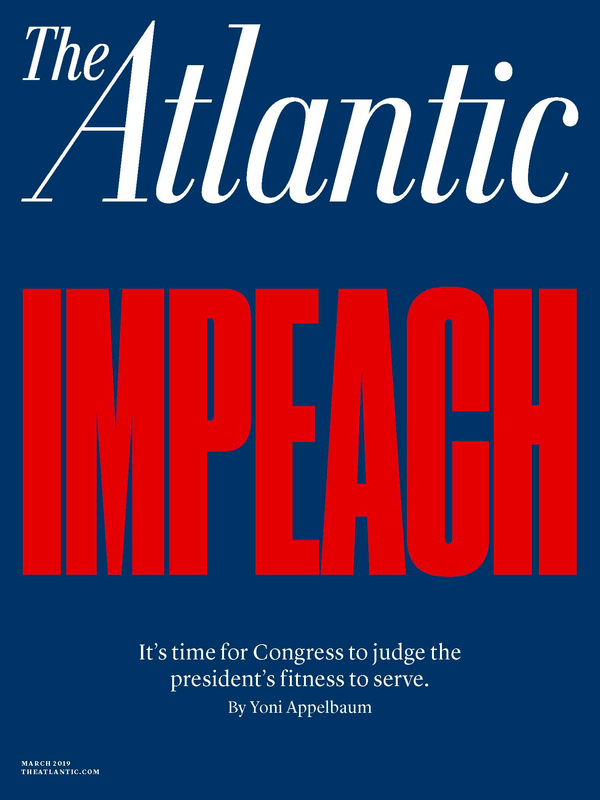 The Atlantic: "The Case for Impeachment"
"Even if the impeachment of Donald Trump fails to produce a conviction in the Senate, it can safeguard the constitutional order from a president who seeks to undermine it. The protections of the process alone are formidable." "Congress must decide whether the greater risk lies in executing the Constitution, or in deferring to voters to do what it cannot muster the courage to do itself." Beijing will cling to Made in China 2025. Venezuelan President Nicolas Maduro will be forced out. Big personality will be key: Will the U.S. have a full-year recession? Will there be a war of miscalculation in the South China Sea? Will war flare in eastern Europe? The answer to all these questions relies on the whims of big, unpredictable personalities — President Trump, China's Xi Jinping, Russia's Vladimir Putin — who dominate geopolitics in a way not seen in decades. A child born today is half as likely to die before age 5 than if she was born in 2000. Bill and Melinda Gates told reporters yesterday that deaths of the world's children under 5 have dropped more than half over the past couple decades, per Axios' Eileen O'Reilly. Deaths from infectious diseases like HIV, malaria and measles have halved from their 1990 levels. Investments by four major global funds, which have received almost $10 billion from the Bill and Melinda Gates Foundation since 1999, get part of the credit, they said. The two said conquering polio has been a much more drawn-out and expensive battle than they originally anticipated. And the world is nowhere near ready to address a pandemic. Bill Gates said: "[T]he level of distraction by domestic issues — or issues that are confined to the rich world — do make us somewhat concerned that the great success story here and the need to renew these resources may not get the attention it deserves." 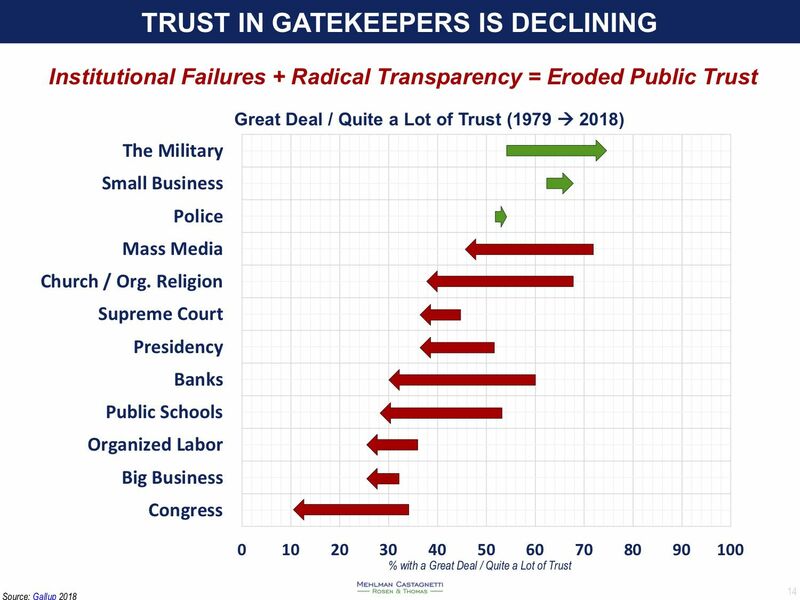 Bruce Mehlman of Mehlman Castagnetti Rosen & Thomas, in one of his hotly awaited decks, says we're moving toward a "Permissionless Planet," spurring "mounting calls for new guardrails, gatekeepers or even systemic reform." 10. 1 historic thing: "Redefining Representation"
The N.Y. Times has published a series of portraits to document the record 131 women in Congress, evoking the imagery we're used to seeing in the halls of power. "Viewed together, the photographs demonstrate the scale of the number of women in both the House and Senate." "But, when seen as singular portraits, each image represents an individual with her own perspective — in political beliefs, personal goals and histories." For sure worthy of $3. Buy the section for a young person you love.